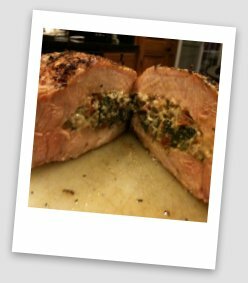 I can't explain how good this stuffed pork chop recipe is. What makes it even better is you can do this on your Weber charcoal grill. I have included a video on this page so I will be with you every step of the way. 1. Call your meat department and have them cut you bone-in pork chops at 1 3/4 inches thickness. 2. Have hickory chips on hand. 3. Watch the video prior to starting. This is VERY important. 4. Enjoy the process and share this recipe with your kids, grand kids, friends and/or family. 5. Allow the chops to come to room temperature (20 minutes or so) before taking to the grill. This stuffing will take care of four 1 3/4 inch bone-in pork chops. The key to this smoked and stuffed pork chop recipe is to take your time. 1. Saute' the garlic in olive oil. 2. Add the mushrooms and saute' for 3 to 4 minutes. 3. Add and saute' the sun dried tomatoes. 4. Add the thyme and rosemary. 5. Add the spinach and cook down for 5 to 7 minutes. 6. Add the chicken broth, salt and pepper. 7. Allow to come to room temperature. 8. Add the cream cheese and bread crumbs. Place slits in the chops per the video. Stuff and close with toothpicks. Slow smoke over indirect heat for 30 minutes, then finish over direct heat for 5 minutes on each side. Allow to rest for 5 minutes, then serve. ENJOY! Click Here to Ask Dave a Question About This Recipe!